Homesharing is a way of supporting people in their own homes by matching them with someone who needs affordable housing and is willing to help out. The home provider offers a spare room to the homesharer at a very low cost (or sometimes no cost at all) in exchange for their support with specified tasks. The tasks might include shopping, preparing meals, walking the dog, gardening, child care, help with the computer and providing companionship. Mutual support and companionship lie at the heart of homesharing. The home provider and the homesharer are carefully matched by an agency (called a ‘homeshare programme’). Programme managers suggest matches that ensure the two parties are compatible, establish a formal agreement and usually support the match for its duration. 2 What’s the difference between having a homesharer and taking in a lodger? The relationship between a home provider and a lodger is essentially a financial one – lodgers pay a market rate for their room. Lodgers do not provide support and companionship to the home provider. A lodger normally has a key to their room and has no obligation to be ‘at home’ for specified periods. A homesharer is essentially a supportive companion and the relationship is one of mutual help and friendship. Many homesharers come to be regarded as ‘family’. They do not have a key to their room door and are asked to live in the home (with occasional holidays and weekends off) to ensure that their home provider feels safe and secure. 3 Who are typical home providers and homesharers? 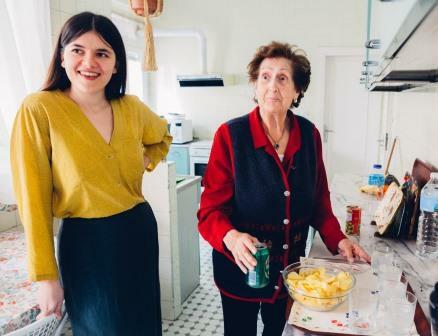 Many homeshare programmes aim to support older people in their own homes and their homesharers are typically young people, sometime students or people starting out in their careers. But homesharing is a very flexible service and both home providers and homesharers can be any age. Some programmes match single parents for instance, others are supporting people with disabilities. 4 Is homesharing an alternative for older or disabled people who need care? No. Homesharers are not expected to provide personal care for the home provider though their support might include cooking meals and taking people to medical appointments, for instance. However, some home providers have both a homesharer and professional carers. There are also known instances where homesharing has been so successful that older people have regained their health and independence and no longer need care. 5 Who runs homeshare programmes? Are programmes regulated? Programmes may be run by non-profit organisations, often registered charities, by individuals who make a living by offering the service, and sometimes by commercial companies, often as an adjunct to other services. Programmes are independent of each other and are not run or inspected by Homeshare International. Homeshare programmes are not regulated by the state in any country as far as we are aware. Programmes that join the Homeshare International Network have to sign up to a Charter of good practice but HI cannot inspect programmes for compliance. 6 What does Homeshare International offer? We are an educational charity and aim to support homeshare practitioners and to encourage the setting up of new programmes round the world. Currently there are programmes in 15 countries, some of them established as a direct result of our work. We support practitioners through our website, Network and biennial congresses which bring people together to exchange experiences and share their learning. 7 How do I become a home provider? What would I need to offer? What should I expect in exchange? First, find out whether there is a programme near you and contact them for information. Sadly, homeshare programmes reach only limited parts of the globe. If there is a programme in your area, the manager will visit you to assess your needs and suitability to take part. You need to be able to offer a decent room in your home, and shared use of the kitchen, bathroom and living room. You also need to be genuinely interested in sharing your life with another, usually younger person – it’s a two-way relationship. In exchange for providing a room you should expect to get help around the home tailored to your needs (a typical arrangement is 10 hours help a week). Your homesharer will live in most days of the week so that you get the security of someone in the house, especially at night. In all likelihood you will also get a life-changing experience – we hear many heart-warming stories about how homesharing has brought lasting friendship and immense joy. 8 How do I become a homesharer? What would I need to offer? What should I expect in exchange? Find out whether there is a programme near where you want to live and contact them for information. You need to live in the country to apply – you cannot apply from a distance. Be aware that homeshare programmes reach only limited parts of the globe. Homesharers are often described as ‘young people’ but in fact they can be any age over 18 (or sometimes older) and many are middle aged. You are expected to be a student or working at your own job in the day time. To become a homesharer you need to be genuinely interested in sharing your life with another person – you will be turned down if you are simply looking for a cheap place to live. In exchange you can expect a good home at little or no cost in exchange for giving support to your home provider (often 10 hours support a week). You might, for example, be asked to help with shopping, taking out the rubbish, tidying the garden, or accompanying the person to medical appointments. You should also expect a life- changing experience. Many homesharers come to regard their home provider as close friends and tell us how much they have learned, typically from an older generation. 9 Can Homeshare International help me to find a match? Sorry but HI does not run programmes so we can’t help you with this. Please go to the programme directory to find out about programmes in your area. If there isn’t a programme, see the next question. 10 There is no homeshare programme in my area. Can I arrange a homeshare match for myself? Yes you can. But there are pitfalls so only try this if you feel you can deal with it. There are many issues to consider, the major one being finding someone of proven integrity who will not try to take advantage of you. There is an excellent guide to ‘do-it-yourself’ homesharing from Homeshare Vermont which will guide you through all the issues: A Vermonter’s guide to homesharing. Online homesharing services where people can search for suitable homesharers do exist but be aware that applicants are not vetted. You should treat them with the same caution as you would with responses to an advert in the local paper. See the next question. 11 Does Homeshare International support the idea of online matching? We receive regular enquiries from people who wish to set up an online homeshare service, to enable home providers to choose homesharers from a bank of possibilities, and vice versa, so as to avoid the need for a homeshare programme to act as intermediary. In our view successful and safe homesharing requires the facilitation of a third party (an individual or organisation) to carefully match home providers with homesharers for their mutual benefit. Many home providers – be they older people or people living with disabilities – are considered vulnerable adults in this context. Online matching – such as AirBnB or dating agencies – require that both parties to the transaction are equally competent, equally responsible and equally able to extricate themselves from the situation if everything goes wrong. Homeshare matching is not like that. Homeshare programmes not only provide advice and help through the initial screening and matching process, but are also there to help if things go awry. They will end a match when the time comes; they will replace a homesharer who moves on or whose circumstances change. So homesharing by our definition is a personal service, flexible enough to reassure all people (and their families) that they are safe and being supported. For these reasons, we do not support the development of online homeshare matching services. 12 Isn’t there a risk in sharing your home with a stranger? Yes, which is why homeshare programmes put so much effort into screening applicants. Homeshare programmes interview candidates in depth, ask for references and do background checks on homesharers before they take up residence. Some programmes also vet the home providers on the same lines. Provided that your service is coming from a reputable homeshare programme, there is no more risk in having a homesharer than in having professional carers come into your home. In our experience the risks of homesharing are negligible. Abuse is exceptionally rare – and in those few cases it has been the home provider who has tried to take advantage of a young homesharer (by treating them as live-in servants for example). 13 How do we set up a homeshare programme in our area? Start with our website where you will find a list of resources for practitioners. There are guides to starting up that cover all the basics – the legal framework, financial issues, different homeshare models, marketing, using volunteers and so on. You are welcome to join the Homeshare International Network to be put in touch with people who can support you through the process. If you can, attend our next congress where you’ll meet many experts face to face. People in the homeshare movement are very generous in sharing their knowledge and experience with newcomers. 14 What are the benefits of homesharing? Older or disabled people benefit directly from support at home with tasks they may find challenging. Homesharers get affordable accommodation – an important benefit for those in expensive cities such as London or Melbourne and for people on low incomes everywhere. Homesharing breaks down loneliness and social isolation. Loneliness is recognised as a major risk to health. Families of home providers benefit from the peace of mind of knowing someone of integrity is living with and supporting their relative. Families of homesharers know that their relative is living in decent, affordable, secure accommodation with someone who can support them. Homesharing is known to delay older people’s admission to more expensive options such as care homes. Homesharing makes better use of existing housing stock. Some countries, such as the UK, have severe housing shortages and many older people are ‘under-occupying’ homes that are too large for them. Health services benefit because many older homesharers enjoy improved health and make fewer demands on services. Hospitals benefit by being able to discharge people back to their own homes; ‘bed-blocking’ by older patients is critical in some health care systems. Homesharing is a flexible solution to many needs – it works equally well for single parents for example. Homesharing breaks down barriers between generations and cultures. Homesharing changes lives for the better. 15 Homesharing is a brilliantly simple idea that helps many different people. So why are there so few programmes across the world? There are many barriers to homesharing and they differ in different parts of the world. Cultural factors are high on the list – some societies expect families to support their older or disabled relatives and there is no tradition of strangers ever being allowed into the home. In some societies housing is too small or unsuitable for sharing. In countries where programmes do exist, funding the programmes is a challenge. Few governments are willing to fund programmes, for a variety of reasons. Homeshare is a labour-intensive service and therefore expensive to run (the benefits to the public purse are difficult to factor in.) Some countries are unaware of homesharing and its benefits. In other places there are legal barriers to homesharing (for example, tenancy laws). We would like a better answer to this question so that we can attempt to address the issues. We have devised an outline research proposal to find out more about the barriers. If you are an academic looking for a project (for which you could obtain funding) please get in touch with us.